Notice! D-Resort Grand Azur Marmaris does not accept reservations at this time. Please try again later. D-Resort Grand Azur Marmaris Contact. D-Resort Grand Azur Marmaris is 2 minutes walk from the beach. Fully renovated in 2013, D-Resort Grand Azur Marmaris is situated in a tropical garden just a few steps from the Mediterranean Sea. It has a private beach area, large outdoor pool with sun-lounger terrace and offers air-conditioned guestrooms. The rooms of D-Resort Grand Azur Marmaris feature large floor-to-ceiling windows with panoramic views. They have modern furnishings and are decorated in neutral colours. Each room comes equipped with satellite TV, tea/coffee making facilities and a minibar. The restaurant serves international cuisine and traditional Turkish dishes made from fresh ingredients. Each morning a buffet breakfast is offered with fruit and hot coffee. Hotel also offers set menu on half-board basis. Guests can enjoy a massage, or visit the fitness centre which features free weights and cardiovascular equipment. The resort has a tennis court and an indoor pool. D-Resort Grand Azur Marmaris is just 1.2 miles from the lively centre of Marmaris, and Marmaris Castle is less than 1.9 miles away. The resort offers 24-hour front desk service and free private on-site parking. This is our guests' favourite part of Marmaris, according to independent reviews. 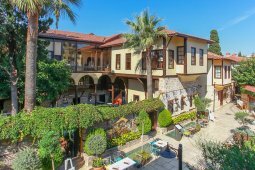 This property also has one of the best-rated locations in Marmaris! Guests are happier about it compared to other properties in the area. D-Resort Grand Azur Marmaris accepts VISA and reserves the right to temporarily hold an amount prior to arrival. D-Resort Grand Azur Marmaris accepts Master Card and reserves the right to temporarily hold an amount prior to arrival. D-Resort Grand Azur Marmaris accepts Maestro and reserves the right to temporarily hold an amount prior to arrival. D-Resort Grand Azur Marmaris accepts Bank card and reserves the right to temporarily hold an amount prior to arrival. D-Resort Grand Azur Marmaris accepts ATM card and reserves the right to temporarily hold an amount prior to arrival. Free buffet meals in the morning, lunch and dinner. Local and foreign alcoholic and non-alcoholic beverages are free 24 hours in Lobby Bar. The day of the minibar is filled with water, soda, soft drinks, beer, chips and chocolates and is refreshed daily. Freshly squeezed orange juice is free for breakfast. Steak & Bara La Carte restaurant booked and paid. Steak & Bar serves between Tuesdays and Sundays. Wireless internet is free in public areas and rooms. The jacuzzi in the outdoor pool area is free, while the jacuzzi in the SPA area offers a fee. The entrance to D Resort Grand Azur Marmaris starts from 14:00 hours. The departure time from the rooms is no later than 12.00. Tesise pet is not accepted. The use of outdoor open spaces is subject to seasonal conditions. Apart from the suite rooms, 2 + 2 or 3 + 1 accomodations in standard rooms can create jams in the room and the extra beds provided may not be comfortable with the fixed bed. Ultra all inclusive accommodation is based on the evening meal, including dinner until the number of nights you have stayed, and ends with lunch on the day of departure. We stayed in this hotel for 5nights, to start with, the rooms were comfy, big and neat, the furniture were old. As for the service and the food, one of the worst experience I had. The waiters are extremely mean(except 1, the girl with the short hair, she was always smiling) and the food was disgusting. We had a complimentary breakfast and dinner but we ended up eating outside the hotel. I would never go back to this hotel, don't get fooled with the "5 stars", it's barely a 3stars hotel. Very good wifi connection in all hotel facilities. Nice food and good service, friendly staff. - 25% discount on honeymoon couples who want to take advantage of Azur SPA massage facilities.